Stout terminal tackle is necessary for hauling in gigantic catfish. In its simplest form, jug fishing requires little more than a two-liter bottle, length of line, sinker and a baited hook. But if you upgrade your materials and invest a little time building your jugs, you can catch more fish and have more fun doing so. 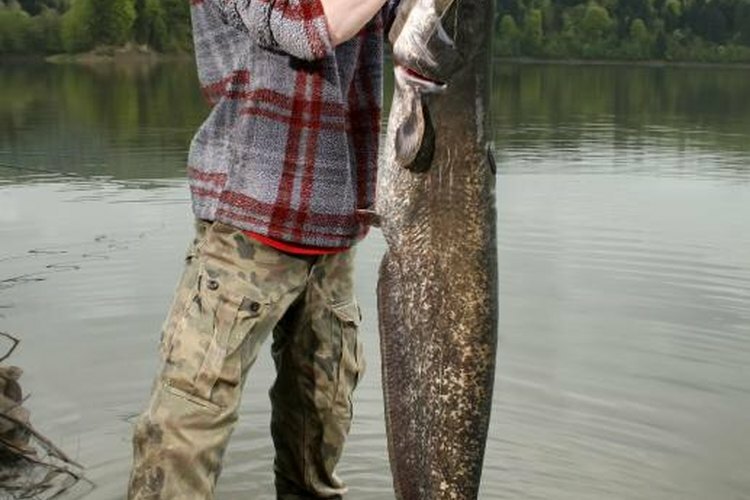 Most jug anglers target catfish, but the principles and equipment are largely applicable for targeting other game fish as well. Check for any laws regarding jug fishing in your area. Historically, two-liter bottles, milk jugs and old bleach bottles were go-to materials for jug anglers. However, a 12-inch section of a foam “swimming noodle,” wrapped around a 20-inch-long PVC pipe, makes a jug that takes up less space. Toss a heavy nail in the pipe and place a cap at each end; then, insert an eye bolt into the cap opposite the swimming noodle. Once completed, you will attach the main line to the eye bolt. Seal all the cracks with silicone or PVC glue. When setting the jugs, rest them horizontally on the surface of the water – when a big cat slams your bait, the float will tip and rest vertically, courtesy of the nail. This allows you to see which jugs have hooked fish before raising them from the water. Catfish are rarely line-shy, so opt for a stout main line to reduce the chances of losing a big one. You can use monofilament in a pinch, but 150- to 200-pound-test nylon braided twine is far superior. Tailor the length of the main line to your favorite fishing holes – if you spend most of your time on a 10-foot-deep farm pond, make the lines about 12 feet long to give you a bit of wiggle room. By contrast, anglers targeting deep-water-dwelling summer cats should equip jugs with at least 20 to 30 feet of line to reach deep enough. Wrap the main line around the float when storing jugs. Some anglers prefer jugs that drift with the current, but it is easier to work your lines if you anchor the jugs in place by tying a one- to five-pound weight to the bottom of the main line. A red brick – or half of one – makes a convenient and affordable anchor, but you could use a water-filled bottle or heavy sinkers if you prefer. If you forgo the anchor, attach a small sinker – an ounce or two in weight is sufficient -- to the bottom of the main line to keep the bait from floating or swimming to the surface. Tie about 12 to 24 inches of monofilament leader or braided line to the main line with an Albright special knot, about 12 inches from the anchor or sinker. Live bait, such as night crawlers or minnows, are the most commonly used and effective baits for jug fishing, so tie an appropriately sized offset circle hook to the end of the leader with an improved clinch knot. If legal to do so in your area, you can add multiple leaders to the main line.